This is is my 50th blog post! I’m so happy to have started this little collection of favorite recipes and random thoughts. It’s been so much fun to take pictures of treats and share them with you! I love talking to people from new places and discovering new blogs. I’m hoping to keep doing this for a long time! To celebrate this tiny milestone, I made these cupcakes. I took pictures of them, and then I shoved them into my mouth. SO GOOD! 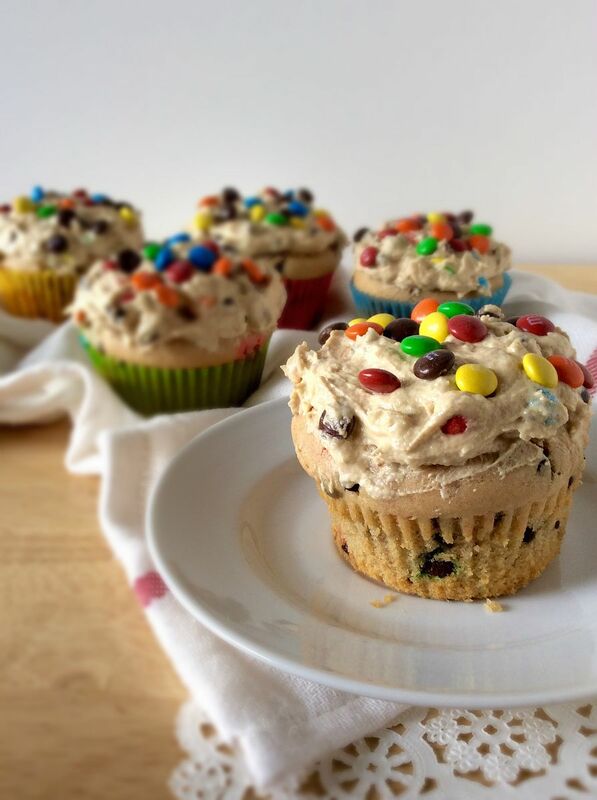 The cookie cupcakes are full of mini chips and M&M’s, and ended up being the perfect sturdy base without being dense. The frosting has some cream cheese in it that makes it seriously addicting. 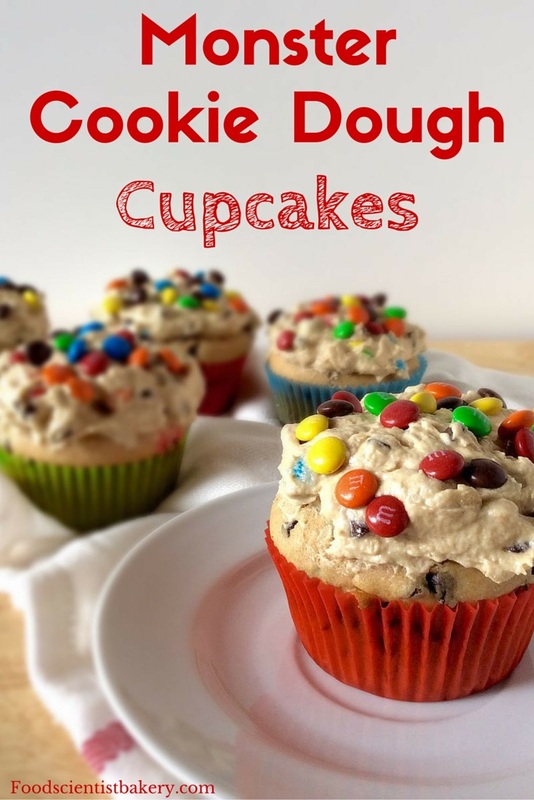 They taste just like monster cookies, topped with cookie dough dip! I sent them with my husband to his work, because otherwise I would’ve eaten them all. Preheat oven to 350 F. Line a cupcake pan with 12 paper liners. In the bowl of an electric mixer, blend butter, peanut butter, and sugar until light, ~2 minutes. Add eggs and vanilla and beat well. Slowly add flour and baking powder, then add milk and mix just until combined. Stir in chocolate chips and M&M’s with a spoon. Fill each cupcake liner about 3/4 full of batter. Bake for 20 minutes or until toothpick inserted in center cupcake comes out clean. Let cool on wire rack. In the bowl of an electric mixer, us the whisk attachment to beat cream cheese, butter, and peanut butter until smooth. Add brown sugar, flour, vanilla, and oats; mix until well combined. Beat in powdered sugar 1/4 cup at a time until the consistency is thick. Add the heavy whipping cream and beat on medium-high for ~3 minutes. Fold in chocolate chips and M&Ms. Use a spoon to frost the cooled cupcakes (I used the cone method to ensure lots of frosting taste in every bite!). Store in the fridge for up to 3 days. these look SO GOOD, oh my word! yum!! They’re like this magical blend of cookie dough and cookie. I love them! I hadn’t, either! It’s all thanks to Pinterest. It was a great idea, though! I’m curious why the frosting calls for oats? Can I omit them? I’m making them for my sons birthday for his kindergarten class and want all of the children to love them! Yes, you can omit them! They’re just there to replicate the taste of monster cookie dough. I’m sure they’ll be a big hit with the kids! Oh these look delicious! And what a great idea to add the m&m’s on top of the frosting, makes them look so colourful! I want to give these a try soon. Frosting always seems to fail when I make it, but this frosting recipe sounds yummy and doable. Is there anything to substitute for the peanut butter? I would suggest almond butter or maybe sunflower seed butter. I have some chocolate almond butter that would probably taste great in these, although it is a little trickier to work with because it’s more solid than peanut butter. Hope that helps! Pingback: 20 Holiday Recipes with M&M's- Bake Up Some Holiday Fun | Read. Write. Mom!